Best radar detector for motorcycle use? Cluster of three red LEDs (upper left) serves as a visual alert and mounts on the handlebar. A few years ago we reviewed the the first-generation Adaptiv TPX, a new radar detector targeting the motorcycle market. It showed promise, but we were disappointed by its user interface, the controls and, more important, by its feeble radar-detection performance. Recently we heard from Adaptiv Technologies, advising us that the TPX has been updated and suggesting that we take another look. Here's what we found. The Adaptiv TPX 2.0 is a specialized piece and focused on the motorcycle market. Among other features, it's weather-protected, an attribute that doesn't apply to conventional radar detectors. And the eight-foot-long control harness is permanently affixed to the detector, protected by a weatherproof strain relief. A weatherproof DIN connector near the detector allows the TPX to be removed from the bike. Two heavy-gauge wires supply power and chassis ground to the detector and attach to the battery terminals. Officer's view of 67 mph motorcycle through head-up display of Kustom Signals ProLaser 4. Target range is 1,743 feet. At the battery end of the cable, one water-resistant 3.5 mm female connector links to the visual alerts. Another connector routes the detector's audio to the rider's choice of communications system, often a helmet headset or earbud speakers. A wireless headset ($70) can also be used to convey the mono alerts to a single helmet speaker. The third connector links to an optional Blinder laser jammer, good at countering speed lasers. Some may feel that a motorcycle is too poor a target to be much concerned about lasers. Poor compared to a car, perhaps, but most lasers can easily clock a motorcycle at 700 feet or more. And with 95,000-odd lasers in service nationwide, laser protection is worth considering. We ordered the Adaptiv universal handlebar mount ($85) that fits bars with diameters from 0.875 inch to 1.25 inches. The inside of its handlebar clamp is lined with high-durometer rubber-like material to dampen shock loads; a double-ball-joint, two-inch-long arm links it to a detector platform measuring 2.25 inches by 4.375 inches. It's a quality piece, powder-coated in matte black, and adjustable over a wide range of movement. Once adjusted, an Allen wrench snugs it down. Installation on a recent-vintage Yamaha R6 sportbike was a reasonably painless process; most of the time was expended on gaining access to the battery and routing the wiring harness around the tank. Once we'd installed the system, we found that the handlebar mount was positioned too low and no amount of tweaking could remedy the situation. This was due to insufficient length of the short, two-inch-long arm connecting the handlebar bracket and detector platform. The TPX radar detector's five soft-key control buttons are top-mounted and easily located. They’re widely spaced and backlit, assisting in nighttime operation. Its blue-backlit LCD display is also located on top and angled upward for better legibility by the rider. Aside from a power button, four others control operating mode, backlight on/off and audio volume. The last two functions require a deliberate, two-second press, rather a long time for a multi-tasking rider. Six operating modes are available. City raises the threshold at which audible alerts are sounded, helping to limit urban false alarms, while Highway offers the highest sensitivity (radar warning range). City NoX shuts off X band and City NoXK disables K band as well. Highway NoX and Highway NoXK likewise disable X and/or K bands. City, City NoX and Highway modes are common, but we've never seen Highway-NoX or -NoXK. The obvious intent is to shut off X band, or X plus K band, in a bid to limit false alarms. The former setting is worthwhile in most areas as X-band radar is little used today save by the Ohio Highway Patrol. The same can't be said about K band; there remain about 30,000 of these radars in service around the nation. Unfortunately, there's no mention of this in the owner manual. The various operating modes are described in a few brief sentences but there's no explanation of the potentially significant downside to using some of them. The disabling of one or more bands, called selectable band defeat, is nothing new. But other manufacturers handle the task with a menu of user preferences, the more elegant solution. Adding these functions to the mode button makes for undue complexity, and slow changes of operating mode. Visual alerts are provided by an array of three red LEDs that flash more rapidly as signal strength increases. The LCD screen identifies the threat but it washes out in sunlight, making the specifics of radar or laser attacks impossible to decipher visually. The LEDs merely warns that a microwave signal or lidar beam is being detected; it offers no clue about the nature of the threat. This an important distinction. In today's microwave-saturated airwaves, most alerts are false alarms. 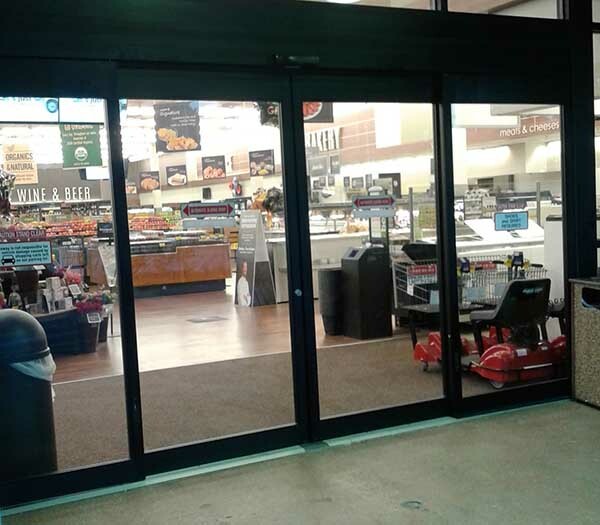 The source of an X-band alert, for example, is nearly always an automatic door opener at a commercial establishment. K band is nearly as polluted by non-police radar sources, door openers included. Conventional radar detectors take every signal as legit; when they smell radar they bark. The proven solution to date is the GPS-enabled radar detector, best exemplified by the Radenso XP and Radenso Pro M.
Given the plentiful number of false alarms uttered by this and most other detectors, the lack of effective visual alerts places a heavy burden on the audible alerts. And while the Adaptiv TPX's audible alerts are far better than nothing, but you’ll need to be listening intently when they arrive. The Adaptiv TPX shows some evidence of careful design. But it does have some shortcomings for a detector at this price point. For example, audio auto mute is missing from the list of standard features. Although common on $60 radar detectors, its absence means that to mute an alert, you’ll need to press a button on the detector to kill the din. But once a signal has been muted, if a new threat is spotted, there's no audible alert. 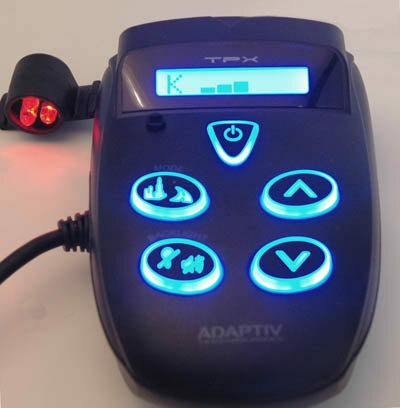 Nor does the Adaptiv TPX have automatic power-off. Permanently attached to the battery, it's always running and though it doesn't draw much juice, it's enough to eventually drain the battery. Motorcycle radar detectors frequently are used in close proximity to each other, so we quantified the ability of the Adaptiv TPX to ignore the local oscillators of nearby detectors. 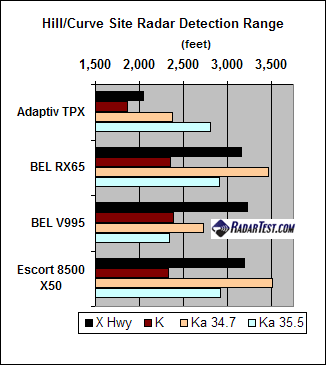 Hill/Curve test site radar is aimed uphill at mid-curve, targeting vehicls at close range. We also checked to see if the TPX's local oscillator interfered with other detectors'. We found that the TPX barked Ka-band alerts when several models of Cobra and Whistler radar detectors came within 10 to 15 feet of it. Riding solo, no worries. But on group rides, someone packing a TPX conceivably may be asked to put some distance between themselves and others using detectors. We also discovered that the RDD (radar detector detector) can spot the Adaptiv TPX at a considerable distance. The Technisonics VG-2 Interceptor, still used by several state highway patrols, detected the TPX from 608 feet away. This makes the TPX the first detector we've tested in years that can be spotted by the 1989-vintage VG-2. The far more sophisticated Stealth Microsystems Spectre RDD sniffed out the TPX at 991 feet. For this reason we'd advise against using the Adaptiv TPX in Virginia, Washington, D.C., or in the Canadian provinces where detector use is illegal. The Adaptiv TPX displayed lackluster X-band sensitivity, about one-third less than the others', but still enough to spot the radar in time. Although only the Ohio Highway Patrol continues to use X band, riders there will be interested in a detector's ability to spot this radar frequency. The TPX displayed an average ability to detect K band radar. Against 34.7 GHz Ka-band radar it trailed the competition by about 20 percent. Only on 35.5 GHz Ka-band did it display near-parity with the competing models. During testing we discovered an anomaly in the TPX signal-processing software: if K- and Ka-band radars are detected simultaneously, there's no alert. Although this is admittedly an infrequent occurrence, the oversight is surprising. Other manufacturers use threat prioritazation with higher-level signals getting preference. Although still not class-competitive across the board, the TPX 2.0 shows a vast improvement in performance compared to the Adaptiv TPX 1.0. We were disappointed by gaps in its performance envelope and comparative lack of features. Still, as the only water-resistant, motorcycle-specific radar detector, it remains in a class of one, reason enough for consideration by some.